Coach Avery Drost is entering his second season as head coach of the Mustangs Boys Volleyball Program. Building on a first season which saw the Varsity team win a Bay League title and reach the quarterfinals of the CIF playoffs, his goal remains to compete at the highest level of High School Volleyball in the country while developing a program culture that serves the whole community. Avery graduated from Westmont College in Santa Barbara where he played indoor volleyball for the Warriors and developed as a beach player at East Beach. In 2010 he relocated to the South Bay, and has called it home ever since. He has played professionally on the AVP Tour since 2011, and with the USA Beach National Team since 2012 – competing around the country and across the world. 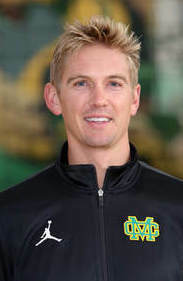 Prior to joining Costa indoor, Avery has served as an assistant and now head coach for the Costa Boys Beach Volleyball team, and coached boys club volleyball with Pac6 Volleyball Club in Pacific Palisades and with local club MB Surf. As a coach, Avery’s philosophy is built around teaching and mentoring players to take ownership of their team and their play on the court. He believes in creating a culture of challenge and growth supported by brotherhood and trust. The expectation of every player is to play with joy, and to compete for one another. Avery and his wife Alyson have been married since 2012 and have two children, Blake (2) and Micah (3 Months). 2018 marks Brad's second year as a varsity assistant coach at Mira Costa High School. Brad is excited to continue to build upon the outstanding tradition of excellence that the MCHS boys volleyball program is known for. Prior to joining the boys volleyball team at Costa, Brad trained with the USA Men’s National Team and spent three seasons playing professionally in Germany and Greece. Brad graduated from Stanford University in 2012 with a BA in Science, Technology, and Society, and garnered multiple awards during his collegiate playing career. These included MPSF Player of the Year honors in 2010, the 2010 NCAA Tournament MVP award, and three First-Team All-American nods from the AVCA. 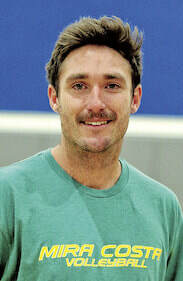 Brad was born and raised in Honolulu, Hawaii, and developed a love for volleyball at a young age. Originally introduced to the game at the famed Outrigger Canoe Club on the shores of Waikiki, Brad joined his first club team at the age of 12. A quick learner from an athletic family, Brad progressed rapidly in the sport and soon caught the eye of USA Youth National Team coaches. Brad played through the ranks at both the USA Youth and Junior levels and was eventually invited to train with the Men’s National Team in 2013. After deciding to hang up his shoes at the end of 2014, Brad moved to Southern California to compete on the AVP Tour during the 2015 season. Brad no longer competes professionally, but still remains active in the sport and has coached numerous clinics in California, Hawaii, and Oregon. Brad most recently assisted the junior varsity boys team at Windward School in Mar Vista and is thrilled to have another opportunity to give back in the local volleyball community. Brad brings a keen eye to the coaching staff as well as a wealth of playing and coaching experience. Brad has high expectations for the varsity team this season and looks forward to providing solid leadership and valuable volleyball acumen to the boys this year. This is Greg's fifth year coaching and the first year on the Varsity coaching staff. In 2016, Coach Snyder led the Frosh-Soph team to the League Championship. As a student at Costa in the early 90's, he was a standout volleyball and soccer player. Coach Snyder was a starting outside hitter on the 1993 CIF semi-finalist squad coached by Mike Cook. With strong fundamentals and stellar defense, Coach Snyder was also one of the few rated beach players in the 1993 class. Turning down offers from smaller east coast schools, Coach Snyder attended LMU where he played Division I soccer and coached summer camps. With his degree, Coach Snyder became an award winning graphic designer/animator and Art Director for television networks with clients such as FX, CBS, ABC, HBO, and ABC Family. Coach Snyder still plays beach ball and lives in Hermosa Beach with his wife and son. Coach Cook retired from the rigors of head coaching varsity, in addition to organizing the entire volleyball program, after the 2008 season. But he has stayed on coaching the junior varsity and assisting as asked at the varsity practices. So the paterfamilias, for the thirty-sixth season is again a fixture in Fisher Gymnasium with six rings on his fingers, twenty-five varsity league championships under his belt, and a 627-93 varsity match record at Mira Costa. 2001-2002 – back-to-back CIF Champions, the first time in school history, combining for a 57-1 match record. 2008 – THE COMEBACK: never has a team rallied from a 0-2 deficit to win a Division I CIF Championship. Also treasured, this during Coach Cook’s junior varsity tenure, is the 101 match winning streak compiled from the 2009 through the beginning of the 2012 seasons, which includes nine tournament championships. High school boys’ volleyball was founded as a club program in the spring of 1972. Coach Cook was one of the pioneer coaches (at that time employed by Serra High School in nearby Gardena) and is the only one active today. After that initial twelve team club league in ’72, the club program expanded to about 35 teams in ’73; then, so many new programs came aboard in ’74 that the CIF picked up the sport for that spring and organized leagues and playoffs from that year forward. 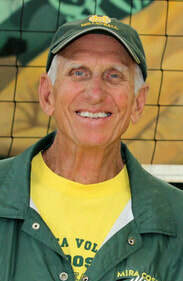 Prior to coaching at Mira Costa, Mike coached at the aforementioned Serra High where he developed a reputation for building strong teams without the benefit of beach talent, while winning four consecutive Camino Real League championships from 1974-77. Coach Cook has a master’s degree in English from USC, his teaching credential from Loyola-Marymount, and, though retired, still teaches two classes of Latin at Mira Costa which include four different levels (courses) from beginners to translators of Vergil. Coach Cook is dedicated this spring to once again mentoring the junior varsity—physically, mentally, and morally—into varsity champions for 2017-18. These players are most fortunate to be associated with one of the legends of high school coaching, the only volleyball coach thus far to be inducted into the prestigious California Coaches Association Hall of Fame (2005).